Two flavors from the season spring from the earth into these beautiful, delicious and nutritious cupcakes. A sure sign that spring is here is the appearance of wild greens and among them perhaps the most nutritious one is stinging nettles. Imagine the delight early foragers felt as they gathered nettles knowing their bodies would soon be fortified with vitamins and minerals missing from their diets in the long winter months. Nettles appear in many recipes this time of year. Nettles are most commonly seen in recipes for teas and infusions or are steamed and eaten like other greens and are added to soups, stews and pestos. This recipe presents a fun new way to add stinging nettles to your diet: in a cake! 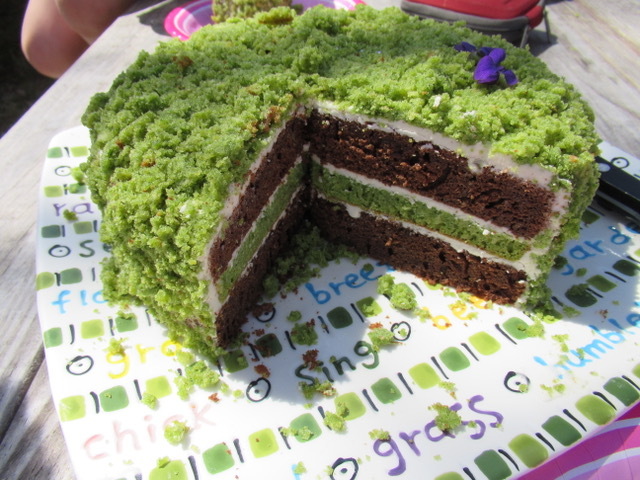 My daughter, who happens to have her birthday when fresh tender nettles are first popping from the ground, loves fairies When I saw this stunning moss cake from www.wondermith.com I knew it would make the perfect fairy cake for her birthday. When you crumble the stinging nettle cake it looks just like moss! The first time I made the cake I layered the brilliant green cake with chocolate cake and then topped with the moss-like crumbles. The contrasting layers looked beautiful and the cake was delicious too. This year, I wanted to try cupcakes so each person would have their own mossy delight. 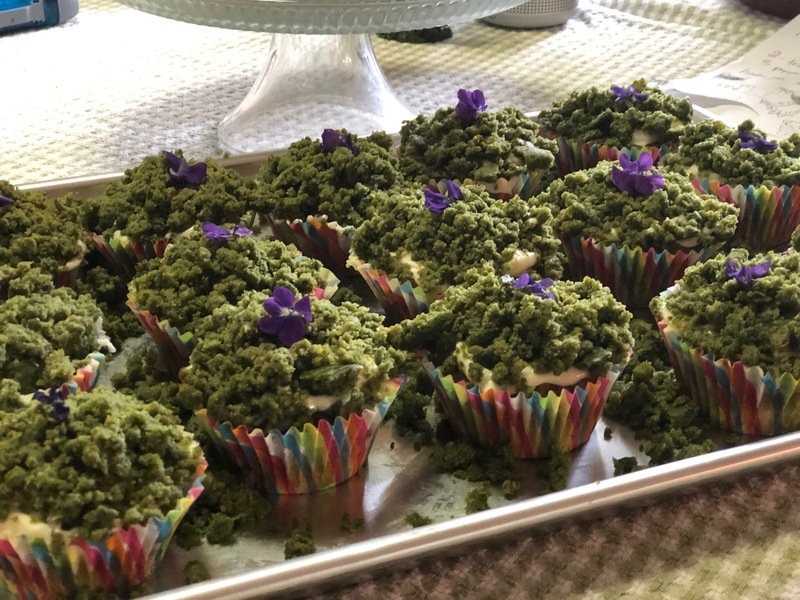 I topped our favorite orange carrot muffins with cream cheese frosting and the lovely nettle-green moss. It just feels right to have the flavor of with sweet over-wintered carrots shining under a layer of luscious green moss this time of year. To make the carrot moss cake, use the orange carrot muffins, top with your homemade cream cheese frosting. To make the appearance of moss on the top of the muffins bake the stinging nettle moss cake, let it cool and them crumble it into pieces. The smaller the pieces, the more it will resemble moss. Press the crumbled moss cake into the frosting. Decorate with edible violet flowers or fairies and enjoy this taste of early spring at your special occassion. If working with stinging nettles does appeal to you try spinach in this recipe instead. 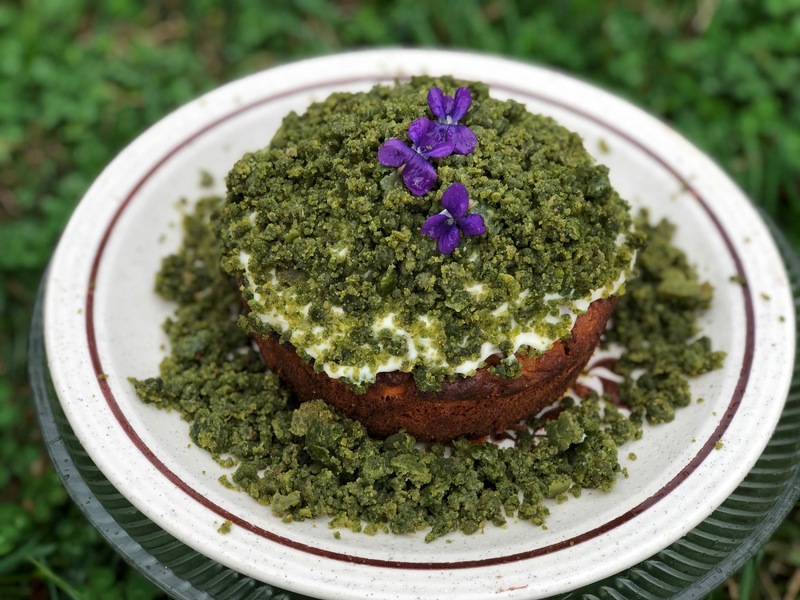 The real star of the recipe, the stinging moss nettle cake, comes directly from https://www.thewondersmith.com/blog/2018/3/13/nettle-cake-an-ode-to-moss-gazing.Check out the lovely pictures there! Preheat your oven to 325F and prepare 2 (9”) cake pans and 1 smaller pan (any shape) by lightly greasing and dusting with flour. Cut out a circle of parchment paper to fit the bottom and grease it as well. In a large bowl, cream the shortening and the sugar. Add the eggs, one at a time, until they are well combined. Add the vanilla, lemon juice, and lemon zest and mix well. Add the nettle puree. In another bowl, sift the flour, baking powder, and salt. Mix well, then mix into the nettle mixture. Pour into baking pans and bake until a toothpick inserted in the center comes out clean, or about 25 minutes. 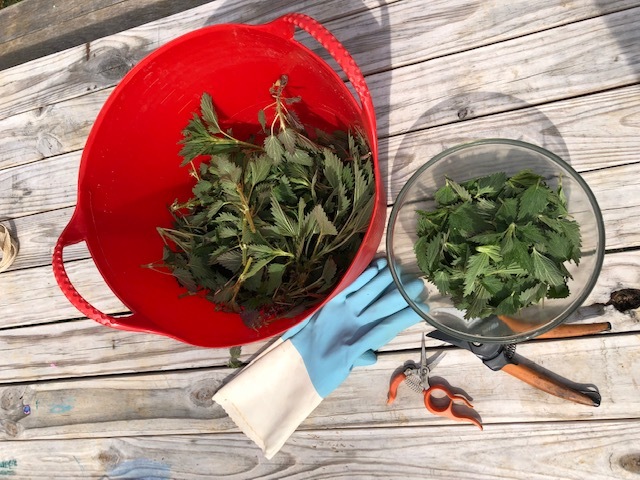 To make stinging nettle puree, pick off all of the leaves (wear gloves! ), then boil them for a couple of minutes. Strain and immediately plunge into an ice bath to cool. Puree the cooked leaves into a smooth paste in your blender – you may need to add 1 Tbs. of water to get them to grind properly. To make a spinach puree, just blend raw baby spinach leaves in the blender with enough water to get them to form a smooth puree. Make sure to note the lower baking temperature of this cake. Baking it at a lower temperature for longer helps it retain the fresh green color. In a medium bowl combine melted butter and orange juice. Make sure mixture is at room temperature before continuing (or the eggs may cook when added). Add eggs and vanilla and whisk until smooth. Add grated carrots and stir until combined. Set aside. In a large bowl, sift together the dry ingredients: whole wheat flour, all purpose flour, coconut sugar, cinnamon, nutmeg, baking powder, and baking soda. Add the orange carrot mixture to the dry mixture and stir until just moistened and no traces of flour pockets remain. Pour into muffin tins. Fill about 3/4 full. Let muffins cool, frost and press stinging nettle moss crumbles into the frosting.